Time and attendance system is usually followed in all departments to record employees start and stop work and other activities like meals, breaks, and type of work performed. Every department has scheduled working hours apart from that; departments do want to keep a record of non-working hours of the employees. Non-working hours like vacation time and compensation time are awarded to the employees. Time and attendance system is very helpful for the organizations. It helps an employer to control over working hours of the employees. The employer can contribute those working hours to improve the productivity of the business. Employee’s regular and punctual attendance makes a system to be run efficiently and it enhances overall benefits for the business. It helps reduce overpayments. The companies with a large number of employees need some fast running clock system that helps employees to record their attendance in less time. Attendance system helps businesses to avoid payroll fraud and increase the accuracy of the wages to be paid. Many software is available on the internet that facilitates a user to obtain an attendance record easily. However, we are providing here an attendance certificate template that will serve the purpose efficiently. A perfect attendance certificate template is designed for the concerned authorities to award it to an individual who is the most regular in his/her department of work. A school principal can award this certificate to the most regular student in the school. In the same way, other departments or companies can do it for the employees working. The attendance award certificate can be made best used to award all those individuals who perform better in attendance. The attendance can be calculated at the end of one month or at the end of a year depends upon management policy. 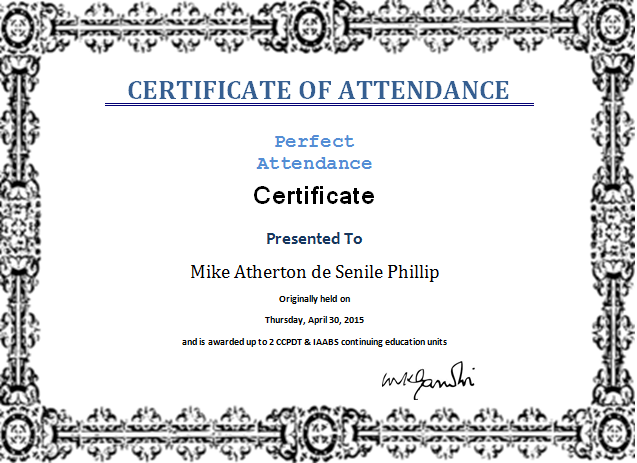 The perfect attendance certificate is a best-designed certificate by expert professionals. It has been designed to keep in mind the need. The template given here serves the purpose in the best way. It can be customized easily as per user’s requirement. A preview of the certificate template is also given below.